Lucknow, India—The delivery was normal, the mother was fine, but her newborn son hadn’t cried yet. Sarita Pal, the nurse assisting with the birth, acted quickly. As the mother’s worried and expectant looks followed her, Pal scooped up the unresponsive baby, thoroughly dried him, immediately cut the cord and moved the baby over to the newborn corner. There, she positioned him appropriately, then stimulated him and used her recent training to resuscitate the baby by using the Ambu bag and mask. On Pal’s second attempt, the baby opened his eyes and cried loudly. “The look on the mother’s face was as if I had given life to her child. She looked so happy when the baby smiled back at her in her arms,” recalls the 26-year-old nurse. Pal attributes her ability to act quickly, appropriately and confidently in resuscitating the newborn to her participation in a Jhpiego-supported quality improvement initiative in private health care institutions in Uttar Pradesh and Jharkhand. The hospital in Lucknow city, where Pal works, is one of the 145 health institutions participating in this initiative. In Uttar Pradesh, a state that still suffers from poor health indicators and where close to 20 percent of deliveries occur in the private sector, the need to ensure quality in private health care facilities cannot be understated. Jhpiego Nurse-midwife Marion Subah joins CEO Leslie Mancuso at the Merck for Mothers “Business as Unusual” Event Sept. 28. Jhpiego, in collaboration with Merck for Mothers and the Federation of Obstetric and Gynecological Societies of India, has been implementing this program, “Leveraging Private Enterprise for Improved Access to Maternal and Newborn Health Services in India,” at private health facilities in 11 large cities of these two states since 2014. Under this program, more than 1,000 providers have been supported to provide quality and respectful care, especially during labor and immediately following birth—the period most critical for a mother and her newborn. The process of quality improvement involves an intensive, two-day training using 27 performance standards in four prime areas: normal labor and delivery including immediate newborn care; management of complications; postnatal care for the mother and newborn; and postpartum family planning, including counseling and insertion skills for the postpartum intrauterine contraceptive device. Testing of the providers’ skills on key, evidence-based, lifesaving practices before and after the training showed a remarkable improvement in their scores, which increased from an average of 39 percent to 70 percent of the performance standards met. As a follow-up to the training, regular supportive supervision visits by Jhpiego help to ensure that the standards are followed across an institution and create an enabling environment for delivery of quality services. 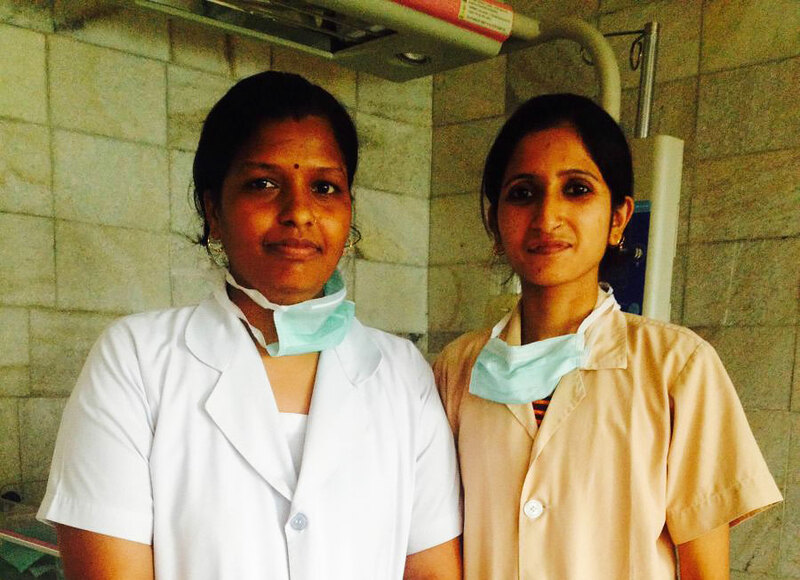 Nurse Sarita Pal (right) credits a program supported by Jhpiego and Merck for Mothers for strengthening her delivery of quality health care services. (Photo by Jhpiego/A.Khan). Speaking with health care providers at the facility, one learns that—along with updated knowledge and skills to perform several essential practices like plotting partographs to monitor progress of labor and carrying out newborn resuscitation and active management of third stage of labor—nurses are using the best practice of placing the newborn on the mother’s belly right after birth. In addition, mothers are taught and encouraged to perform kangaroo mother care, a practice of swaddling the baby to the mother’s chest to help underweight newborns thrive and grow. Maternal mortality ratio: 285 (Sample Registration System 2013); neonatal mortality rate: 49, infant mortality rate: 68 (Annual Health Survey 2013).